No tricks, all treats. That’s what life is about when you’re the son of the man who championed the Air Jordan line on-court. We’re talking about Marcus Jordan, of course, heir to the marquee basketball brand’s throne. Marcus has been all over the place with the Jumpman this year, giving us an exclusive look at the Air Jordan 1 “Family Forever” that he helped design for Father’s Day. Now he’s showcasing two of the most sought after retros remaining this year in the Air Jordan 6 Black/Infrared and the Air Jordan 11 “Legend Blue”. The Legend Blue branding has been disputed as fans of the more traditional side of things want a full on Air Jordan 11 “Columbia” Retro, but with an outsole that’s just a bit more vibrant, perhaps the iciness will stay a little longer. 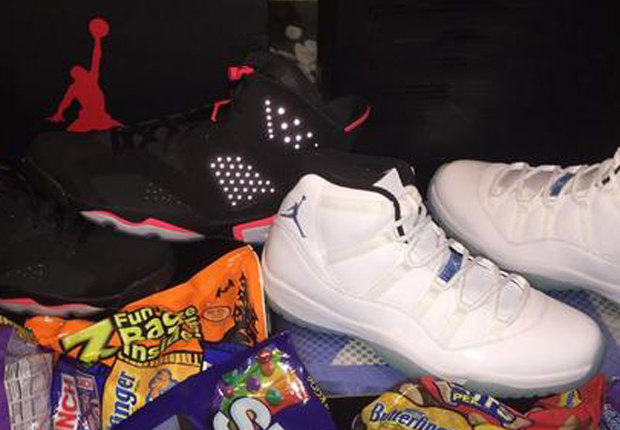 Be sure to check out a full look at Marcus Jordan’s Halloween treats after the break and let us know which pair you’re looking forward to more – the Columbia 11s or Infrared 6s – in the comments section.